Monroe Community Hospital is a county-owned health care facility providing quality long-term care to individuals with complex and chronic health conditions. We are home to residents of all ages—from infants to centenarians-and we provide a comprehensive range of health care services including skilled nursing care, short-stay rehabilitation and specialty care. Since its inception, Monroe Community Hospital has been a dynamic institution—evolving throughout the decades to meet society’s changing needs. The origins of Monroe Community Hospital can actually be traced back to 1826. Just five years after the County of Monroe was officially founded, a small brick building along South Avenue opened as the County Almshouse-one of the first facilities of its kind in the state. The building originally accommodated only 75 people, but as our community grew, the facility adapted to meet the increasing demands on its services. By 1929, however, concerns with overcrowding and fire safety at the Almshouse prompted the County to review the future of the building. County officials commissioned Siegmund Firestone, a notable Rochester architect and engineer, to investigate the current situation and to recommend a plan for its future. It was Mr. Firestone who made the recommendation that the County consider building a new facility better suited to care for the growing number of long-term and chronic care patients and to move the building’s location to East Henrietta Road. The County accepted his plan, and Firestone was hired to design and oversee the construction of this new facility. Construction of the building that we now know as Monroe Community Hospital began in 1931, in the midst of the nation’s Great Depression. Mr. Firestone incorporated many innovative ideas into his design of the building and ensured that the project employed all local contractors. Mr. Firestone also hired a talented young architectural student and draftsman Thomas Boyde, Jr. as one of his assistants, and Boyde then became the first African-American architect in our community. Following nearly three years of construction and at a cost of $4 million, the new facility opened as the Monroe Community Home and Infirmary on August 1, 1933. The innovations in interior design as well as the beautiful, ornate exterior earned national recognition. The building was heralded as a model health care facility, and one publication called it “the most efficient installation of its kind anywhere.” It set new standards for hospital design, balancing the intertwined medical, psychological, and social needs of its residents with the need for efficient, cost-effective care. From the 1930s through the 1950s, Monroe County Home and Infirmary functioned as a general hospital, providing medical, surgical, maternity, pediatric, and dental services for the indigent. In 1967, the County changed the facility’s name to the Monroe Community Hospital for the Care of the Chronically Ill. The name change reflected a shift to address the rising population of elderly in the community. 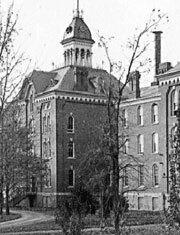 At that time, Monroe County also entered into an agreement with the University of Rochester School of Medicine and Dentistry to provide medical personnel and services, improving upon the quality and continuity of patient care. As part of the affiliation agreement between Monroe County and the University of Rochester, Dr. T. Franklin Williams became the first Medical Director at MCH under the new affiliation. The population that MCH serves today, however, has changed significantly from its early days. MCH now provides long-term care and rehabilitation for residents of all ages, from eight-week old infants to centenarians. Nearly three-quarters of the residents at MCH use wheelchairs, and the majority have complex medical and psychological needs requiring extensive medical and nursing care. To keep pace with these changes and to better meet the complex needs of our patient population, Monroe Community Hospital embarked on an ambitious Master Facility Renovation Project in 1994. Following years of planning and preparation, MCH took the first bold steps in this massive undertaking in December 1994. As the project has progressed, nearly every part of the interior of the 635,000 square foot building has been completely rebuilt and modernized. What Is New at MCH?